Asbestos exposure causes incurable but preventable cancer to both workers and consumers. The story of such criminal recklessness by the asbestos industry has been documented in a dossier titled "India's Asbestos Time Bomb". The dossier recommends, "The only way for the government to remedy the situation created by the asbestos industry is to implement a complete ban on the mining, manufacture, use and trade of all kinds of asbestos including chrysotile (white) asbestos." While the reality is quite grim as far as the workers and consumers are concerned, industry continues to enjoy the patronage of the central government and all state governments. So much so that on September 24th, 2008 an Investment Advisor said, "If I were to sell my house and buy a stock I would probably buy this (Visaka Industries) asbestos-cement (AC) sheets manufacturing stock because it is coming at a very good valuation and there is a significant increase in profits expected over the next two-years." Illustrating the grim reality of asbestos exposure both through personal accounts and research papers, the book notes: "Although mesothelioma, asbestos related lung cancer are recognized around the world, in India neither one of the diseases is commonly reported. This is not surprising as in India, cancer is not a notifiable disease," in a paper titled Asbestos-Related Disease in India. Examining the role of the medical community, the dossier underlines, "Occupational Health is taught as a part of much maligned subject of Community Medicine, and students rarely have access to standard ILO radiological plates, mandatory for asbestosis diagnosis, even in the top medical colleges…consequently, even a first ranking radiology physician, lacking the expertise to diagnose asbestosis unambiguously, may be compelled to certify an X–ray as normal when it is not". This has resulted in the failure by the medical professionals to issue asbestos related diagnoses, leaving the victims with no option but to die a slow and painful death. The study takes cognisance of countless studies that have shown that all varieties of asbestos, asbestos products and asbestos wastes are carcinogenic. Even though trade in asbestos waste is banned in India, the manner in which authorities have been indulgent in allowing the entry of asbestos waste laden toxic ships such as Riky and Blue Lady shows that a dangerous precedent of illegal traffic in asbestos waste has been set to the detriment of workers, communities and the adjoining environment. 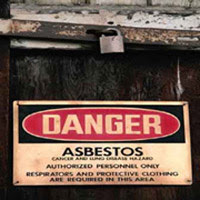 As to asbestos situation in Maharashtra, there are asbestos factories in the Mumbai, Pune, Kolhapur, Kalyan, Nashik, Thane and Aurangabad region. The companies that are there in these regions include Hindustan Composite Ltd., Swastik roofing Ltd., Kross International, Shakti Roofing Pvt. Ltd, Wilson Roofing Product. Pvt. Ltd., Hydrabad Industries Ltd, Roofit Industries Ltd. Wada Arun Asbestos Pvt. Ltd., Eastwell Asbestos Ind. Pvt. Ltd, Everest Industries Ltd, Bosch Chassis Systems Pvt. Ltd. (formerly Kalyani Breaks Ltd.), Champion Seals) Pvt. Ltd, Mechanical Packing Industries Ltd., Jain asbestos and Capital Commerce Pvt. Ltd. (formerly Rufit Industries Ltd.). In Nagpur, Amravati, Navi Mumbai and Raigad region, there is no unit engaged in manufacturing of asbestos. 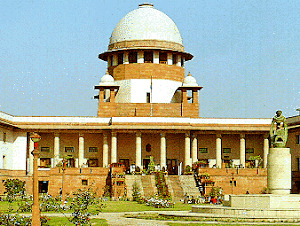 It is noteworthy that under massive criticism from all quarters both Union Ministry of Environment and Forests and Union Ministry of Labour & Employment admitted in the Rajya Sabha and Lok Sabha on that the government has undertaken a conflict of interest ridden study to give clean chit to chrysotile asbestos, a cancer causing mineral on March 20, 2008 and March 17, 2008 respectively. 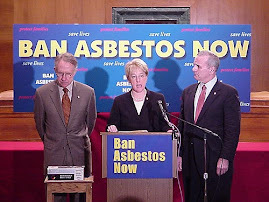 Earlier in its 2001 verdict, Appellate Body of World Trade Organisation while upholding chrysotile asbestos ban in France (European Community) had soundly rejected the "controlled use" and safe use argument of the Canadian asbestos industry. 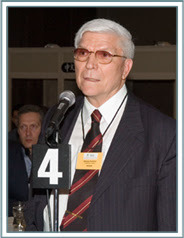 In its 95th Session of the International Labour Conference on 14th June 2006, International Labour Organtisation adopted a resolution for the elimination of all forms of asbestos from future use as the only way forward for protecting workers. It passed this resolution "Considering that all forms of asbestos, including chrysotile, are classified as known human carcinogens by the International Agency for Research on Cancer, a classification restated by the International Programme on Chemical Safety (a joint Programme of the International Labour Organization, the World Health Organization and the United Nations Environment Programme)". In the light of the an unprecedented occupational health crisis due to ongoing asbestos exposure, environmental, labour and human rights organisations have called upon the government to support the inclusion of Chrysotile Asbestos in the list of UN's Rotterdam Convention on the Prior Informed Consent Procedure for Certain Hazardous Chemicals and Pesticides in International Trade at the next conference of the Parties to the Rotterdam Convention will be held from October 27 to 31, 2008 in Rome. So far Indian government, irrespective of the ruling party, has consistently colluded with asbestos interests against the interests of workers and consumers. As per data released by the U.N. Statistics Division, India imported about 306,000 tonnes of asbestos in 2006. Of which, 152,820 tonnes was imported from Russia and 63,980 tonnes from Canada. It is estimated that cumulative asbestos consumption will exceed 7 million tonnes by the end of 2008. What is most alarming is that as of now there is a political consensus to promote its use in India. The acts of omission and commission by all the agencies that are working in tandem with Russian and Canadian asbestos producers must be brought under a scanner to set matters right. Insulated from media's attention in India, death toll due to asbestos is rising at an alarming rate. Even as such manifest acts of corporate crimes are underway routinely without any conviction till date, all news agencies remain dogmatically focussed on street crimes. Both state and central governments have devised a very simple way of responding to it. They have ensured that the deaths caused by asbestos are not counted ever by any institution. As result, Indian asbestos industry is well-insulated from the ongoing global ban on asbestos. So far some 50 countries have banned asbestos. The only way forward is to ban the production and use of all forms of asbestos in the country and ensure that safe alternatives are put in place, which will address the issues of health, livelihood and economic implications of banning asbestos. This book has been co-published by International Ban Asbestos Secretariat (IBAS), Ban Asbestos Network of India (BANI), Corporate Accountability Desk, Asia Monitor Resource Centre, People's Training & Research Centre and others. Besides India, the dossier has been released globally in The Netherlands, United Kingdom and Canada. The report warns India is "on the cusp of a devastating asbestos cancer epidemic"
Record and rising asbestos imports to India will translate to thousands of asbestos-related cancer deaths each year and are already responsible for "a hidden epidemic," an expert report has revealed. Exposing the Indian Government's collusion with asbestos stakeholders at home and abroad, the authors call for an immediate national ban on all asbestos use. "India's Asbestos Time Bomb," published today (September 25, 2008) by a coalition of Asian campaign and research organizations, global union federations and the International Ban Asbestos Secretariat (IBAS), calculates that total asbestos usage in India since 1980 exceeds 6 million tonnes, matching the amount used in the UK in its entire industrial history. India is far and away the world's largest importer of asbestos. "The UK is now in the grip of its largest ever industrial disease epidemic, with between 5,000 and 10,000 estimated to be dying of asbestos cancers every year," says report editor Laurie Kazan-Allen. "India, with ineffective regulation on asbestos use, is on the verge of a much larger and more devastating epidemic. Because it can take 30 years or more for asbestos- related cancers to emerge, India faces an inevitable and sharp escalation in cancer cases over the next three decades. No one is safe!" Annual imports of asbestos to India now exceed a quarter of a million tonnes, and have climbed rapidly over the last decade. "We estimate asbestos cancers already claim thousands of lives each year in India, but this will certainly exceed 10,000 cases a year by 2040," says Kazan-Allen. "This will put an incredible strain on families, communities and India's medical system." A hidden epidemic exists due to medical ignorance and government intransigence; in light of the dearth of serious measures to alert workers and consumers of the asbestos hazard, things can only get worse. India does not have a national cancer registry or any system to record asbestos cancers or asbestos exposures, so the problem remains unrecognised and unaddressed. But instead of acting to remedy these failings, the report warns that India is actively encouraging asbestos use, both at home and globally. India, working closely with asbestos stakeholders in Canada, has been instrumental in blocking a United Nations move to impose health information disclosures on exports of chrysotile asbestos. When the UN next considers applying global right-to- know rules on chrysotile at its Rotterdam Convention meeting in Rome this October, it is likely that both nations will again move to veto any effort to require exporters to warn of the risks posed by using chrysotile asbestos. "There is an unimaginable and unconscionable level of ignorance of the asbestos hazard in India, a situation that is a great boon to Indian asbestos companies that are benefiting from huge levels of economic growth," says IBAS's Laurie Kazan-Allen. "The government is a willing conspirator in this state of affairs, with devastating consequences for the health of its citizens. 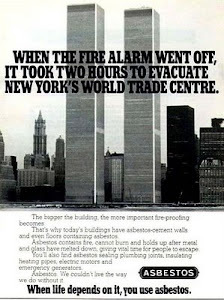 But politicians and asbestos peddlers should take heed – we aim to see the industry wither and die and its apologists face the courts for knowingly and in the name of profit pushing the world's worst ever industrial killer." 1. India's Asbestos Time Bomb is published by the International Ban Asbestos Secretariat (IBAS), the Building and Woodworkers International, International Metalworkers' Federation, Asia Monitor Resource Center, Asian Network for the Rights of Occupational Accident Victims, Corporate Accountability Desk – The Other Media, Ban Asbestos Network India, Peoples Training and Research Centre, Baroda, India. 2. Indian asbestos imports increased from under 40,000 tonnes in 1970 to over 250,000 tonnes in 2006. Since 1960, approximately 7 million tonnes have been imported. 3. India is the world's largest importer of chrysotile asbestos, followed by China, Thailand and the Ukraine – the only countries importing more than 100,000 tonnes. India is Asia's second largest consumer of asbestos. 4. Indian import duty on asbestos was slashed from 78% in 1995-96 to 15% in 2004. Lowering the cost of imported asbestos fiber means that dangerous asbestos-containing products are cheaper than safer alternatives. 5. India does not operate a national cancer registry or record occupational histories with medical records, so the asbestos cancer epidemic is not officially tracked or recorded. There are no official statistics. 6. The Conference of the Parties of the UN Rotterdam Convention1 will take place in Rome from October 27-31, 2008. India and Canada have been instrumental in ensuring previous meetings failed to allow right-to-know controls on asbestos.